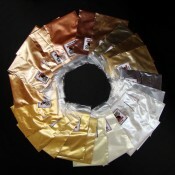 Buy Gilding material, products, supplies and tools here. The term gilding covers the process of applying fine sheets Gold leaf, Silver leaf, Palladium Leaf or gold powder to solid surfaces such as Glass, Metal, Stone and Wood with a thin coating of Precious Metals. 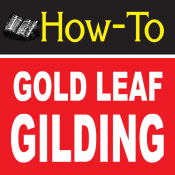 Gilding: Act of applying metal leaf to a surfaces including object. 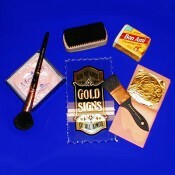 Chemical gilding: gold is used stages in which a state of chemical combination is required. The use of chemicals to assist in bond atomized or powder gold to a surface, some times referred to as Angel Gilding. 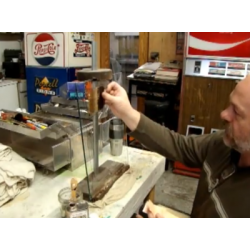 Electroplating: Known as Gold Plating, is the process of plating one metal onto another by hydrolysis, most commonly for decorative purposes or to prevent corrosion of a metal. There are also specific types of electroplating such as copper plating, silver plating, and chromium plating. 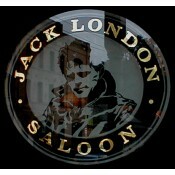 Reverse Glass Gilding: Gilding gold leaf in reverse to view from other side of glass. a mix of decorative Oil and Water advanced gilding technique, Water and Gelatin are combined to create gold sizing, then flowed over glass as a adhesive for attaching gold leaf sheets. Water Gilding: Water and Gelatin are combined to create gold sizing, then flowed over glass as a adhesive for attaching gold leaf sheets. Mirror Gilding: a subset to water gilding, Water and Gelatin are combined to create gold sizing, then flowed over glass as a adhesive for attaching gold leaf sheets. 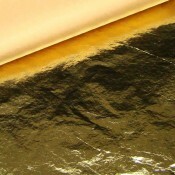 Glass Gilding: a subset to water gilding, Water and Gelatin are combined to create gold sizing, then flowed over glass as a adhesive for attaching gold leaf sheets. Water Gilding on Clay Bole: Bole is Used in Framing Pictures, Furniture and Architectural Decorative Trim is consider to be Surface Gilding. Water Gilding with Bole produces a Satin Glow and Burnishing Gild with Stone smooth Agets produces a shiny Chrome like Shine to the surface Gild. Fine pigmented Bole Clay mixed with Heated Water and ground Rabbit Skin Hide Glue make your basic base and once brushed on, just requires wetting after sanding smoth to apply Gold leaf. Bole is like Gesso. More modern Gilding Boles have Ground Shellac to help attach to woods better, these Boles require a Gilders Liquor made of Water and Methanol Alcohol to wet the Rabbit Skin Glue with water and to soften the Shellac with the Alcohol. Gilding Facts: Gilding gold architectural widow trim was as a protective coating that can resist corrosion for 25-50 years. 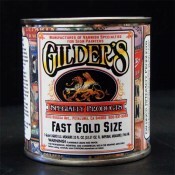 1 shot fast gold leaf sizeBuy 1 Shot Fast Gold Size for sale here in 8 oz Cans, 1/2 Pint. 1 Shot Fast Gold Size is the perfect product for that rush j..
Dux Oil Based Quick Size in a 1/2 Pint container.A clear gilder’s size for fast gold leaf workAchieves tack in approximately 1-1/2 hrsTack will remain..
Dux Oil Based Quick Size in a Pint container.A clear gilder’s size for fast gold leaf workAchieves tack in approximately 1-1/2 hrsTack will remain ope..
Dux Oil Based Quick Size in a Quart container.A clear gilder’s size for fast gold leaf workAchieves tack in approximately 1-1/2 hrsTack will remain op..
Dux Gold Leaf Slow Size - Oil Based 1/2 PintA slow setting oil based leaf adhesive designed for gilding all types of metal leaf on a wide variety of s..
Dux Gold Leaf Slow Size - Oil Based PintA slow setting oil based leaf adhesive designed for gilding all types of metal leaf on a wide variety of subst..
Dux Gold Leaf Slow Size - Oil Based QuartA slow setting oil based leaf adhesive designed for gilding all types of metal leaf on a wide variety of subs..
DUX WATER-BASED GILDING SIZE - 1/2 Pint This water-based size dries to a crystal clear, extended tack in 20-30 minutes. Once dry, it will allow for ..
DUX WATER-BASED GILDING SIZE - Pint This water-based size dries to a crystal clear, extended tack in 20-30 minutes. 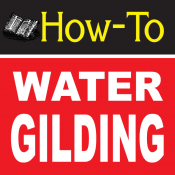 Once dry, it will allow for over..
DUX WATER-BASED GILDING SIZE - Quart This water-based size dries to a crystal clear, extended tack in 20-30 minutes. Once dry, it will allow for ove..
Gilders Chalice-Copper HammeredBuy a Gilders Chalice-Copper Hammered for Sale here to make your Water Size in. This Gilders Chalice is made for100% Co..
Gilders Dusting Mop Brush series-RP8 size10Buy Gilders Dusting Mop Brush series-RP8 size10 for sale here, are used to gently Dust away the excess gold..
Gilders Dusting Mop Brush series-RP8 size14Buy Gilders Dusting Mop Brush series-RP8 size14 for sale here, are used to gently Dust away the excess gold..
Gilders Dusting Mop Brush series-RP8 size18Buy Gilders Dusting Mop Brush series-RP8 size18 for sale here, are used to gently Dust away the excess gold..
Gilders Dusting Mop Brush series-RP8 size20Buy Gilders Dusting Mop Brush series-RP8 size20 for sale here, are used to gently Dust away the excess gold..
Gilders Dusting Mop Brush series-RP8 size24Buy Gilders Dusting Mop Brush series-RP8 size24 for sale here, are used to gently Dust away the excess gold..
Gilders Gold Leaf Glass SoapBuy Gilders Gold Leaf Glass Soap for Sale here, Gilding Soap comes wrapped in a resealable foil package. Perfect for clean..
LeFranc 12 Hour Gold SizeBuy LeFranc 12 Hour Gold Size for sale here. Mixton Oil Size by Charbonnel is the reformulation of the original version that ..
Lefranc 3 Hour Gold SizeBuy Lefranc 3 Hour Gold Size for sale here. 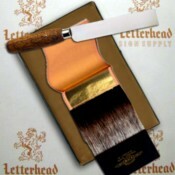 Mixton Oil Size by Charbonnel is the reformulation of the original version that us..
Water Gilding Sizing Brush Series rp5Buy a Water Gilding Sizing Brush Series rp5 for sale here. This Water Size Brush was designed for reverse glass g..